The Detergent Assay Kit (Catalog Number DAK1000) is for detection of various detergents at concentrations below their CMC values for most detergents. The concentration response is characteristic to a specific detergent. The assay is based on the principle that the detergent interacts with dye A43 and enhances the fluorescence intensity at 535 nm (excitation at 485 nm). The assay is sensitive to most detergents including dodecyl maltoside but it is not sensitive to alkyl saccharide detergents with short alkyl chains such as octyl glucoside and nonyl glucoside. For octyl glucoside, please use Beta Octyl Glucoside Assay Kit (catalog number: OG100K). For nonyl glucoside, please use Beta Nonyl Glucoside Assay Kit (catalog number: NG100K). 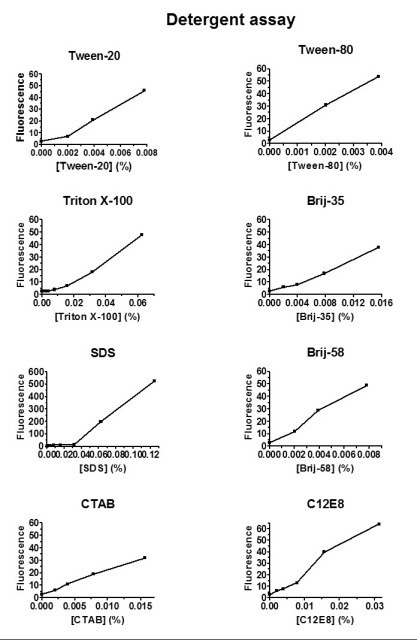 The assay kit is not sensitive to low concentrations of SDS. For SDS, please use NanoGram SDS Assay Kit (catalog number: SDS200). The assay is compatible with most buffers and salts. It is not compatible with DTT, phosphate. Molecules that release phosphate may interfere with the assay. The assay reagent (catalog number DAK1000) is sufficient for measurement of 1000 samples using 96-well plates. It can also be used for measurement of detergent concentrations using cuvettes.